Your rifle is only as accurate as you make it. Here's how to sight it in for tight clusters and long-distance shooting. 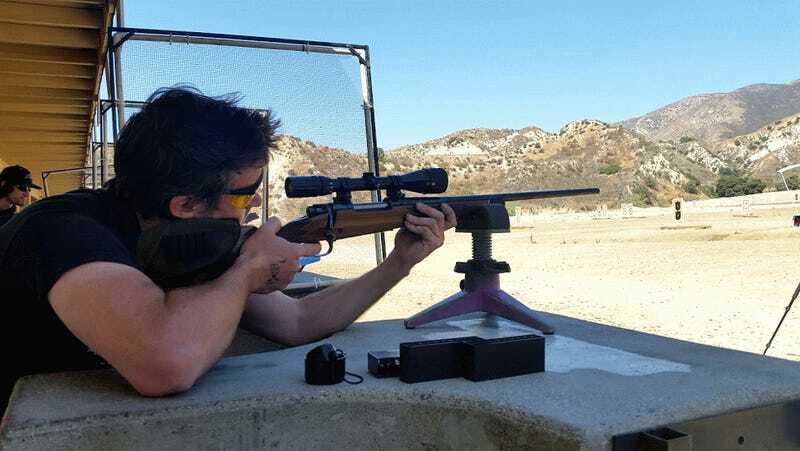 Last weekend Wes and I ventured to the closest public long distance shooting range to L.A. with the goal of sighting in my new Weatherby Mark V Ultra Lightweight, and blasting away those pesky steel sheep and pigs. I'll walk you through what accuracy means for your rifle and what you need to know to get it prepped for that perfect shot. The Weatherby Mark V Ultra Lightweight is under 6 pounds bare and under 7 pounds with a scope! While L.A. may not scream, "let's go shooting!" there are quite a few ranges in decent proximity for long range rifles. Coming from Arizona where I could shoot out my back door and not have the cops called on me, the drive to the range was a little annoying, but turned out to be worth the effort. The Angeles Shooting Range sits about 30 minutes north of L.A. and is very easy to get to. The ease of access does means others will be there with their AR-15s, so don't expect to be alone, especially with deer season just around the corner. If shooting at a range is not for you, public land is often easily accessible. Your local Bureau of Land Management should have plenty of info available to you about where you can and cannot shoot. In Arizona, we would often drive out to the middle of the desert and shoot as we pleased. With the closest wide open area to us being out near Barstow, I was ok with staying in the fringes of the mountains. The benefits of a range can outweigh going to the boonies when you consider the range was set up with steel targets from 100 yards, all the way out to 600. You also have the convenience of supplies. Wes was a little trigger happy, but was able to buy more ammo and keep shooting throughout the day. Minute of Angle, or MOA, is the standard unit of measure for the accuracy of a rifle. What is a "1 MOA grouping"? To understand that, we first need to understand what a minute of angle is. Think hard back to elementary school when you were learning angles. You probably remember SOH-CAH-TOA, the ancient chief of the land of Hypotenuse. As a young lad, I remember measuring angles out to a few decimal points, when in fact, those smaller fractions of 1 degree are called minutes and seconds. There are 60 minutes in 1 degree, 60 seconds in 1 minute. Degrees and minutes might also sound familiar if you are used to reading maps with latitude and longitude, these are all measurements of angles. What does this mean for a rifle?! 1 MOA, or 1/60 of 1 degree, is the angular spread measured at 100 yards. This just so happens to be 1" (1.047" to be exact) at 100 yards. Because this is an angular measurement, it is changing at different distances. The image below should help visualize this. 1 MOA, or 1/60 degree, at different distances (exaggerated for clarity). Just about every manufacturer will claim that their rifle can shoot "Sub MOA". This is great and all, but what does that mean in the field? At 100 yards, you should expect to shoot a 3 shot group all with in a 1" diameter circle or less. Out at 200 yards, this grouping should be within 2 inches, 3" at 300 yards...you get the idea. I will personally tell you that shooting that grouping is hard, no matter what gun you have. If you are professional marksman, mount your high horse and feel proud. In the field, while on a hunt, this sort of accuracy is like saying that you've dialed in your sling shot to hit the side of your annoying brother's Camaro. You don't need to be that accurate to bust out his window. Most North American big game fall into a category called "medium size big game," or "medium game." These includes deer, goats, bear, antelope, and sheep ranging from the elusive, ghost-like white tail deer of Southern Arizona, that are smaller than Wes' dog Wiley, all the way up to the 300 pound range. With a heart-lung kill area ranging from 8" up to 10", you can see where the necessity of having a perfectly sighted in rifle will be more about the bragging rights than it is of being practical. For my hunt next month, I know that terrain will limit me to shots of no more than about 300 yards. To keep an effective kill range, I need to have my rifle sighted in to 2 MOA and still have room for a little error. This means that at 100 yards, I need to be able to shoot a 2" group, at 200 yards, a 4" group, and at 300 yards, a 6" group. None of this sounds overwhelmingly impressive, and that's because our world of over-hyping media has made you believe that ever person who has ever picked up any rifle can shoot Sub MOA on their first time out. Sub MOA accuracy is pretty irrelevant and unimportant when there are many other more important things for taking the perfect shot, like the consistency of the cartridge and the reliability of the rifle. If this is your first time sighting in a new scope, there are a few things that will make this super quick and extra easy. A rifle rest like a Caldwell Lead Sled would be the first. A bore sight will also greatly help with getting things started off quickly. It is a laser that slips in to the barrel of your rifle and helps you line the scope up to where the barrel is pointing. It is best to do this at a short distance of about 25 yards to get the scope pointed in generally the right direction. We didn't have either one of these conveniences, and were able to sight the rifle in just fine. An ice chest and a Mexican blanket can work great too. Anything you can to do steady the rifle and remove the human error will be extremely helpful in dialing in the rifle. A Caldwell Lead Sled takes the human jitters out of the equation. First things first, wear eye and ear protection! It would be foolish not to and no range will let you on site without either. Ear plugs work fine for me, but ear muffs tend to be more comfortable for most. Also, when the guy next to you is breaking in his new rifle and its awesome muzzle brake that is designed to save his hearing, you can bet that all of those pressure waves are going out to the side where you are sitting. Wear the protection! Most if not all modern rifle scopes are outfitted with a couple of turrets used for adjusting the reticle (cross hairs). On my Leupold VX-6, and most scopes, the elevation turret (up and down) is on the top of the scope and the windage turret (left to right) is on the side. Your scope should tell you what the adjustments mean. Typically they are in 1/4 MOA, or 1/4" per 100 yards per click as shown below. I have found that shooting a 3 shot group, then making adjustments is the best way to dial the scope in. With the scope trained on the center of the target, take 3 shots. Hopefully all 3 shots line up in close proximity to each other and give you an idea of where the scope is pointing relative to where you want it to point. When I started at 100 yards, my grouping was about 1.5" low and 3" to the right. This meant that I need to click the elevation turret 6 clicks up and the windage turret 12 clicks to the left. Letting the barrel cool between shooting a grouping is a really good idea. Your barrel will act differently when it is smoking hot vs. when it is cold. And when you are out on your hunt after hiking 18 miles in to the bush and up and over the high mountains, your barrel will be cold. Patience is needed here to take out each potential error. After a few more groupings, I was dead on at elevation, but still about 3/4" to the left. 3 more clicks back to the right and my .257 magnum is plenty accurate for me. Tweaking the scope to make it just right. Once dialed in, we wanted to see just what this high velocity Weatherby boasting was all about! A friend at the range let us pop a few rounds through his chronograph to measure the muzzle velocity of the 100 grain solid copper Barnes TSX .257 bullet and, as Weatherby claims, their factory rounds are fast — 3623 feet per second fast! The friend who had shot before me was 1000 feet per second slower with his 7mm Mag and a 120 grain bullet. This velocity goes a long way in keeping that long range trajectory super flat. With steel targets out each 100 yards, we were able to see just how far and flat this rifle could shoot. An 8" disk at 200 yards, hit every time with the scope pinned on the center. A small 12" tall pig at 300 yards, again hit every time with the cross hairs near the top of the target. Out at 400 yards, I needed to start accounting for the drop of the bullet, but even with only a few inches held over the top of a 10" disc, I was on target each time. We skipped 500 and wanted to see if we could nail a small sheep target out at 600 yards! In my scope, at 12x magnification, the target was still only about 1/2" tall for what my eye was seeing. Remember, the scope is still sighted in at 100 yards, and according to Weatherby's info the bullet should be dropping more than 3 feet at this distance. I held over about 1.5x the size of the target, and after 4 shots I was not able to connect. We could see the dust cloud of the round landing nearby, but not on target. A small breeze has the very high potential to throw these light rounds around at that long of a distance. The fact that I could hit the steel out at 400 yards with minimal hold over really impressed me. I am confident that any shot I take next month under 300 yards will be dead on. Wes spent most of the day shooting my 40 year old .243 Winchester Model 70, while I had my fun with the Weatherby. We each went through 60 rounds of ammo and neither of us felt too sore after the day was over, I don't think you could say the same if you were shooting any rifle over the .300 caliber size. The sign of a good day.